Robert Stevenson was a lifelong believer in the power of education and the importance of knowledge, and he never stopped trying either to increase his own knowledge or to promote what he had learned. He was a practical self-made man, who always expected his children and staff members to work as hard as he did. He was also a devoted husband, father and grandfather but wasn't given to spoiling his family. His character had a religious aspect too — he was a member of the Church of Scotland and an elder in Edinburgh, at St Mary's in 1828-43 and after that at Greenside parish church. However, the relationships between Stevenson and Smith families were complicated — Stevenson's stepfather was also his father-in-law and business partner. Perhaps because of this, he saw no problem with encouraging nepotism, either in his own family or in relation to the families of his workforce. It has been noted that there were two competing impulses in Stevenson's character. One was his great desire for adventure and belief in enterprise. The other was his perfectionist nature that had him always looking for order. It was this side of his character that led him to instinctively follow military-like arrangements for the running of his workforces in lighthouse construction. Stevenson was energetic and focused, with a fierce gaze and something of a twinkle in his eye. In the summer of 1817, he wrote a lively and informative series of letters to his 16 year-old daughter Jean (also known as Jane), while travelling through the Netherlands visiting drainage and embankment schemes. The letters were published in the Scots Magazine in 1818-21. Stevenson later published the 14 letters privately under the title Journal of a Trip to Holland (1848). Indeed, Stevenson’s numerous writings appeared in more than 60 publications. Many were engineering reports, though about one-third achieved much wider circulation through leading periodicals and encyclopaedias. He contributed six significant articles to the Edinburgh Encyclopaedia between 1810 and 1824, and five to the Encyclopaedia Britannica between 1816 and 1819. The depth and authority of Stevenson's published works means they now represent a valuable historical resource to engineers and historians alike. He was an enthusiastic member of plenty of learned societies, starting with the Highland Society in 1807. He joined the Wernerian Society in May 1809, becoming a member of the council by 1812. He was a founder director of the Astronomical Institution of Edinburgh in 1813. In 1815, he was elected to fellowships of the Royal Society of Edinburgh, the Geological Society and the Society of Antiquaries of Scotland. In 1821 he became a founder subscriber, and later director, of the School of Arts in Edinburgh (the precursor of Heriot-Watt University). He was elected to membership of the Smeatonian Society in 1827 and the Institution of Civil Engineers in 1828. 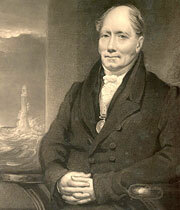 Stevenson retired from his position with the Northern Lighthouse Board at the end of 1842, aged 70 years. His three engineering sons would follow in his footsteps his lead — all would hold the post of Engineer with the Board: Alan from January 1843 until March 1853, when ill health dictated his retirement; David until March 1855; and thereafter David and Thomas as joint Engineers until 1884. In 1846, Stevenson's wife Jean died — and this was also the year that marked his retirement from all engineering matters. Stevenson himself died at the family home — 1 Baxter's Place in Edinburgh — on 12th July 1850, aged 78 years. They are both buried in a tomb in Edinburgh' New Calton Cemetery. The five surviving children outlived them, and sons Alan and Thomas were also eventually buried in the family vault. Alan and David both penned biographies of of their father after his death. To them, the prominent points of his character were sagacity, fortitude, perseverance, unselfishness, generosity and a strong sense of duty. He was tireless in helping young men, many of them apprentices in his own firm, to progress through life in general and the engineering profession in particular. The Northern Lighthouse Board commissioned a marble bust of Stevenson on 19th July 1824, when he was 52 years old and his account of work on Bell Rock Lighthouse had just been published. The bust was carved by Samuel Joseph (1791-1850) and completed in 1827. Unlike many other eminent engineers, Stevenson was not immortalised in memorial statuary after his death — perhaps his lighthouses serve that purpose. Navigation around the coasts of Scotland is safer thanks to his sustained efforts, and those of the dynasty of engineers that he engendered. In 1970, Stevenson College of further education was founded in Edinburgh, something of which its namesake undoubtedly would have approved.